Superyachts arguably offer you the most flexible vacation experience possible but could a new futuristic hotel design be about to change that? The Driftscape Hospitality Project, would allow guests to sleep in personal pods which can both fly and float. As well as being able to sleep in some of the most remote corners of the planet the pods also float meaning you could create your own private island virtually anywhere in the world’s oceans. There see-through design also means that you would have unique views of the sea. The potentially revolutionary concept is a finalist for this year’s Radical Innovation Award. If the pods designers', HOK architectural firm, win they will receive a cash prize which could help make this wild design concept into a reality. Superyachts arguably offer you the most flexible vacation experience possible but could a new futuristic hotel design be about to change that? The Driftscape Hospitality Project, would allow guests to sleep in personal pods which can both fly and float. As well as being able to sleep in some of the most remote corners of the planet the pods also float meaning you could create your own private island virtually anywhere in the world’s oceans. There see-through design also means that you would have unique views of the sea. The potentially revolutionary concept is a finalist for this year’s Radical Innovation Award. If the pods designers', HOK architectural firm, win they will receive a cash prize which could help make this wild design concept into a reality. Although not technically underwater rooms don’t get much better than a floating private pontoon above the Great Barrier Reef. Hovering over a coral reef visitors are able to wake up and dive straight into an underwater wonderland. Unfortunately the experience is only available for the winners of Airbnb’s latest competition which is being run in collaboration with the release of Disney Pixar’s Finding Dory — the sequel to Finding Nemo. Ideal for families the pontoon offers a double bed and a bunk bed with direct access to the surrounding sea. The experience also includes a meal by one of Australia’s leading chefs Neil Perry and a dive and private tour of the coral gardens with a marine biologist. It is hoped that the experience will raise awareness of the fragility of the area. Parts of the Great Barrier Reef have recently experienced the worst coral bleaching on record. Airbnb has pledged to plant wetland plants for every guest visiting the region for the remainder of 2016. Earlier this year Airbnb tried to raise awareness on the importance of protecting sharks by offering guests the chance to sleep in a glass room suspended in the Paris Aquarium. Although not technically underwater rooms don’t get much better than a floating private pontoon above the Great Barrier Reef. Hovering over a coral reef visitors are able to wake up and dive straight into an underwater wonderland. Unfortunately the experience is only available for the winners of Airbnb’s latest competition which is being run in collaboration with the release of Disney Pixar’s Finding Dory — the sequel to Finding Nemo. Ideal for families the pontoon offers a double bed and a bunk bed with direct access to the surrounding sea. The experience also includes a meal by one of Australia’s leading chefs Neil Perry and a dive and private tour of the coral gardens with a marine biologist. It is hoped that the experience will raise awareness of the fragility of the area. Parts of the Great Barrier Reef have recently experienced the worst coral bleaching on record. Airbnb has pledged to plant wetland plants for every guest visiting the region for the remainder of 2016. Earlier this year Airbnb tried to raise awareness on the importance of protecting sharks by offering guests the chance to sleep in a glass room suspended in the Paris Aquarium. 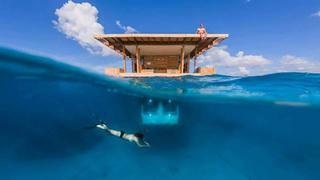 The Manta Resort’s underwater room is a top contender for one of the best places to sleep underwater. The floating structure is comprised of three levels allowing you to sunbathe or take in the night skies as well as the coral reef below. The room lies approximately 250 metres from the shoreline and as part of the experience you will also be served a light lunch, romantic dinner and breakfast on the floating structure. 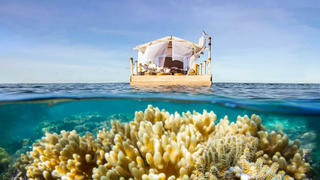 The bedroom offers a double bed with 360° views of the surrounding reef. You will also have some friendly sleeping companions as three bat fish and a trumpet fish called Nick have taken up residence by the room. At night spotlights attract even more fish to the structure. Prices for a night in the Manta Resort’s underwater room start from $1,500 based on two people sharing. 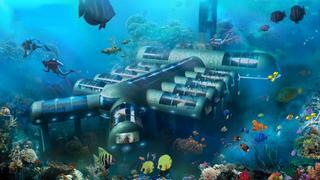 The Manta Resort’s underwater room is a top contender for one of the best places to sleep underwater. The floating structure is comprised of three levels allowing you to sunbathe or take in the night skies as well as the coral reef below. The room lies approximately 250 metres from the shoreline and as part of the experience you will also be served a light lunch, romantic dinner and breakfast on the floating structure. The bedroom offers a double bed with 360° views of the surrounding reef. You will also have some friendly sleeping companions as three bat fish and a trumpet fish called Nick have taken up residence by the room. At night spotlights attract even more fish to the structure. 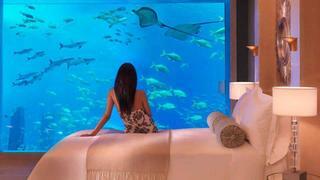 Prices for a night in the Manta Resort’s underwater room start from $1,500 based on two people sharing. The underwater suites at Atlantis at The Palm Dubai — called Poseidon and Neptune — offer floor to ceiling views of the Ambassador Lagoon aquarium, which holds 65,000 marine animals. Covering more than 1,776 square feet the suites feature an open-plan living and dining room, inter-connecting bedrooms, a TV room and a private lift. There is also a 24-hour butler service to ensure your every need is met. Tempted by this underwater luxury? Prices for the suites start at £5,500 per night. The underwater suites at Atlantis at The Palm Dubai — called Poseidon and Neptune — offer floor to ceiling views of the Ambassador Lagoon aquarium, which holds 65,000 marine animals. Covering more than 1,776 square feet the suites feature an open-plan living and dining room, inter-connecting bedrooms, a TV room and a private lift. There is also a 24-hour butler service to ensure your every need is met. Tempted by this underwater luxury? Prices for the suites start at £5,500 per night. The Conrad Maldives Rangali Island may not have underwater bedrooms but it can offer you a unique dining experience under the sea. Sitting five metres below the surface of the Indian Ocean, Ithaa offers 180 degree panoramic views of the vibrant coral gardens surrounding it. The restaurant offers a four-course lunch menu or a seven-course dinner menu. The evening meal is particularly special as it allows you to take in the changing nature of the reef as the sun sets. Ithaa is also open for mid-morning cocktails and can be reserved privately for weddings or other special occasions if you want to make the most of the incredible structure. An unforgettable meal here could be incorporated if you are enjoying a week in the Maldives on a superyacht. The Conrad Maldives Rangali Island may not have underwater bedrooms but it can offer you a unique dining experience under the sea. Sitting five metres below the surface of the Indian Ocean, Ithaa offers 180 degree panoramic views of the vibrant coral gardens surrounding it. The restaurant offers a four-course lunch menu or a seven-course dinner menu. The evening meal is particularly special as it allows you to take in the changing nature of the reef as the sun sets. Ithaa is also open for mid-morning cocktails and can be reserved privately for weddings or other special occasions if you want to make the most of the incredible structure. 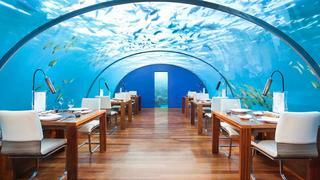 An unforgettable meal here could be incorporated if you are enjoying a week in the Maldives on a superyacht. The world’s first fully underwater hotel may not have been built yet but it is hoped that the Planet Ocean Underwater Hotel may soon become a reality. The 12-room hotel, which will float 8.5 metres beneath the ocean's surface, received a U.S. patent for its innovative design last year. The movable hotel is hoping to improve the health of the world’s oceans by linking “tourism to improving the environment” and will feature a sustainable feeding system to attract marine life. 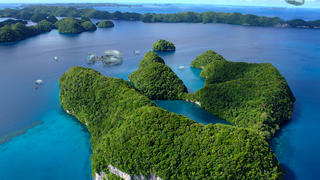 The company also plans to donate 10% of its profits to help aid coral preservation. As well as its eco credentials the hotel will also offer the normal luxuries including cocktails, room service and fine dining with rates starting from $3,000 a night. The project still needs more funding to begin construction but if plans do go ahead it would shoot straight to the top of our list of the best hotels to visit by superyacht. The world’s first fully underwater hotel may not have been built yet but it is hoped that the Planet Ocean Underwater Hotel may soon become a reality. The 12-room hotel, which will float 8.5 metres beneath the ocean's surface, received a U.S. patent for its innovative design last year. The movable hotel is hoping to improve the health of the world’s oceans by linking “tourism to improving the environment” and will feature a sustainable feeding system to attract marine life. The company also plans to donate 10% of its profits to help aid coral preservation. As well as its eco credentials the hotel will also offer the normal luxuries including cocktails, room service and fine dining with rates starting from $3,000 a night. The project still needs more funding to begin construction but if plans do go ahead it would shoot straight to the top of our list of the best hotels to visit by superyacht.